Conagra Brands, Inc. is an American packaged foods company headquartered in Chicago, Illinois. Conagra makes and sells products under various brand names that are available in supermarkets, restaurants, and food service establishments. Conagra was founded in 1919 by Frank Little and Alva Kinney, who brought together four grain mills as Nebraska Consolidated Mills (NCM) with its headquarters in Grand Island, Nebraska. The headquarters were moved to Omaha in 1922. The company ran at a profit until 1936, when Kinney retired. In 1940, the company began producing flour at its own mill, and in 1942 ventured into the livestock feed business. That year president R. S. Dickinson opened the company's first out-of-state facility in Alabama with a flour mill and animal feed plant. After researching new uses for its flour, NCM funded the establishment of the Duncan Hines brand of cake mixes in 1951 as a way to market more flour. This venture was very successful, leading the company to its current place as the third largest flour miller in the U.S. However, this did not lead NCM to consider other food ventures, and instead it sold its assets in Duncan Hines to Procter & Gamble in 1956. As American households purchased more and more prepared and instant foods in the 1950s and 1960s, NCM chose not to expand into the businesses that used its flour, instead turning in the opposite direction and focusing more on raw foods like poultry and expanding its livestock feed business. The previous Conagra Brands logo, which was used until June 2009. In 1971, Nebraska Consolidated Mills changed its name to "ConAgra", a portmanteau of con for consolidated and agra, similarly short in English for agriculture. The 1970s brought the company to the brink of ruin as it lost money expanding into the fertilizer, catfish, and pet product industries and as commodity speculation wiped out ConAgra's margins on raw foods. In 1974, C. Michael "Mike" Harper, an experienced food industry executive, took over the firm and brought it back from the brink of bankruptcy. Nonetheless, ConAgra's business model left it vulnerable to volatile commodity prices. In response, the company set off on a two-decade-long buying spree, purchasing over one hundred prepared food brands, starting with its 1980 purchase of Banquet Foods. It moved heavily into the frozen food business and the packaged meat industry, and then picked up a selection of other brands from firms like RJR Nabisco and Beatrice Foods (including Hunt-Wesson and Swift-Eckrich) among others, as the leveraged buyouts of the 1980s resulted in the divestiture or breakup of many major American consumer product firms. In 1993 alone it purchased $500 million in smaller firms, and in 1998 it purchased another $480 million in brands from Nabisco. Conagra Brands' former headquarters in Omaha, Nebraska. On May 23, 2001, ConAgra Foods Inc (the predecessor to Conagra Brands) said it would restate its earnings for 1998, 1999 and 2000, due to accounting and conduct matters at its United Agri Products Cos unit. For fiscal 1998, revenues was cut from $24.27 billion to $24.19 billion. In 2002, ConAgra Foods sold its fresh meat operations under the name Swift & Company to Hicks, Muse, Tate & Furst Inc. and Booth Creek Management. On March 24, 2005, ConAgra Foods Inc (the predecessor to Conagra Brands) said the results for fiscal 2003 and 2004 would be restated to reflect a reduction in after-tax profits of $150 million to $200 million in total. In 2006, ConAgra Foods sold its Chicago-area-based refrigerated meats business (Butterball, Eckrich, Armour) to Smithfield Foods. ConAgra maintained a presence in Chicago by moving its Hunt-Wesson business there from California. On November 27, 2012, Conagra officials announced the company was purchasing Ralcorp, pending Ralcorp shareholder approval, for approximately $4.95 billion. Stockholders of Ralcorp Holdings Inc. would receive $90 per share. The deal completed in January 2013 and made ConAgra the largest private-label packaged food business in the United States. On October 1, 2015, Conagra announced that it would cut about 1,500 jobs and relocate its headquarters to Chicago as part of a restructuring plan. The move of headquarters from Omaha to Chicago was completed in late June 2016 with the opening of their new HQ at the Merchandise Mart building. It is the first time since 1922 that ConAgra has not been headquartered in Omaha and the first time in the company's history, dating back to its 1919 founding, that the headquarters will not be in the state of Nebraska. On July 14, 2014, Conagra announced that it had acquired TaiMei Potato Industry Limited, a potato processor in Shangdu, Inner Mongolia. This acquisition expands ConAgra Foods' Lamb Weston operations in a market that has growing demand for frozen potato products. On November 18, 2015, Conagra announced it was spinning off its Lamb Weston division into a separate company that would be based in Kennewick, Washington. They also announced that ConAgra Foods would be renamed Conagra Brands when they moved HQ to Chicago in 2016. Thomas Werner (unrelated to the television producer and Boston Red Sox owner) and Timothy McLevish were named executive and executive chairman. The Lamb Weston (NYSE: LW) spinoff was completed on November 9, 2016, with the new company headquartered in the suburbs of Boise, Idaho, with major manufacturing facilities in Oregon and Washington. At the same time, ConAgra Foods changed their name to ConAgra Brands, complete with a brand new logo. On September 22, 2017, Conagra announced that it was acquiring Angie's Artisan Treats, maker of Angie's Boomchickapop popcorn. The acquisition was completed on October 23, 2017. On June 27, 2018, Conagra Brands announced the acquisition of Pinnacle Foods for $8.1 billion. The acquisition closed on October 26, 2018. The board of directors are: Mogens C. Bay, Stephen G. Butler, Steven F. Goldstone, Joie A. Gregor, Rajive Johri, W. G. Jurgensen, Richard H. Lenny, Ruth Ann Marshall, Gary M. Rodkin, Andrew J. Schindler, and Kenneth E. Stinson. Conagra produces a wide array of food products including cooking oil, frozen dinners, hot cocoa, hot dogs, peanut butter and many others. Some of ConAgra's major brands include Hunt's, Healthy Choice, Marie Callender's, Orville Redenbacher's, Slim Jim (snack food), Reddi-wip, Egg Beaters, Hebrew National, P.F. Chang's, Chef Boyardee, Home Menu and Bertolli ready meals. The nonprofit ConAgra Foods Foundation has pledged a five-year commitment of $10 million to Feeding America to fight child hunger. Additionally, ConAgra Foods founded the Child Hunger Ends Here campaign in 2013 that would donate up to 3 million meals equivalent to Feeding America by donating one meal for each code submitted to the campaign's website by consumers. Conagra has been criticized for its lack of response to global climate change. A 2006 report by Ceres, a non-profit organization that works to address global climate change and other sustainability issues, entitled "Corporate Governance and Climate Change: Making the Connection", measures how 100 leading global companies are responding to global warming. Companies in the report were evaluated on a 0 to 100 scale. ConAgra scored a total of 4 points, the lowest of any of the food companies rated. In a 2009 ranking by Newsweek, ConAgra ranked 342nd out of U.S. 500 largest corporations in terms of overall environmental score. In 2003–2004, Conagra participated in a Minnesota Pollution Control Agency voluntary investigation and clean-up program. Through the program, the company cleaned up a property previously used for lithium ore processing and constructed a new 80,000-square-foot (7,000 m2) office/warehouse building. This voluntary program offers "future liability protection". ... the judgment is reversed, and the matter is remanded to the trial court with directions to (1) recalculate the amount of the abatement fund to limit it to the amount necessary to cover the cost of remediating pre-1951 homes, and (2) hold an evidentiary hearing regarding the appointment of a suitable receiver. The Plaintiff shall recover its costs on appeal. In May 2003, Conagra and its subsidiary Gilroy Foods agreed to pay $1.5 million to settle charges of hiring discrimination brought by the Equal Employment Opportunity Commission (EEOC). The charges involved a July 1999 Teamsters strike at a plant in King City, California, then owned by Basic Vegetable Products LP but later purchased by ConAgra. In August 2001, the company negotiated with the union an end to the two-year strike with a new contract that would recall workers based on seniority. However, the recall process excluded workers who were on leave at the time of the purchase including those out due to work injury or pregnancy. Others were denied jobs due to a history of previous injury or illness, despite their having no restrictions on returning to work. According to the EEOC, most of the 39 workers who were excluded from the recall process had been working at the plant for 10 to 30 years and were primarily Hispanic and female. The company's Greeley, Colorado, plant had been cited almost 10 times from 1999 to 2002 for violating worker safety. In July 2004, six people were killed in a shooting inside the ConAgra Foods plant in Kansas City, Kansas. In 1997, Conagra pleaded guilty to federal criminal charges that its Peavey Grain unit illegally sprayed water on stored grain to increase its weight and value and also bribed federal inspectors. The company agreed to pay $8.3 million to resolve the charges, which included a $4.4 million criminal fine, $3.45 million as compensation for illegal profits and $450,000 to reimburse the U.S. Department of Agriculture for storage and investigation expenses. Conagra had also paid $2 million to settle a related civil case filed by a group of Indiana farmers. Multinational Monitor, a corporate watchdog organization, named Conagra one of the 'Top 100 Corporate Criminals of the 1990s'. In 1988, Conagra threatened to relocate from Omaha to Denver, Chicago or Minneapolis if the city didn't help find a new location for its headquarters. Charles Harper, the chief executive of Conagra at the time, requested that the city of Omaha demolish a historic site, one of the largest on the National Register of Historic Places. Omaha approved the demolition of over 20 historic structures in Jobbers Canyon Historic District, a 19th-century warehouse district along the banks of the Missouri River in Downtown Omaha, Nebraska. The demolition made room for a sprawling new corporate campus and headquarters, and prompted protests and lawsuits from historic preservationists. Harper had described the structures as "some big, ugly red brick buildings." The National Trust for Historic Preservation asked that the historic legacy of a city and region not be held hostage to the narrow corporate preferences of a single commercial enterprise, but Conagra refused to reconsider. The Jobbers Canyon district was adjacent to another historic district, the Old Market, which has proved to be an important center of cultural, tourist, and residential development in Omaha. Omaha's then-planning director, Marty Shukert, said it was more important to keep the city's downtown core healthy than to keep the historic district. Others noted that the district was in disrepair and ConAgra's new headquarters have been an aesthetic and economic improvement for the city. In 2015, Conagra announced the relocation of its headquarters to the 100 year old historic Merchandise Market, in Chicago, in spite of Omaha's 1980's demolition of Jobbers Canyon. In 2002, Conagra and other major food and beverage companies including PepsiCo, General Mills, Kelloggs, Sara Lee, and H. J. Heinz Co. spent millions to defeat Oregon Ballot Measure 27, which would have required food companies to label products that contain genetically modified ingredients. According to the Oregon Secretary of State, ConAgra contributed $71,000 to the campaign to defeat the state ballot initiative. Throughout 2012, ConAgra contributed $1,176,700 to a $46 million political campaign known as the Coalition Against the Costly Food Labeling Proposition, sponsored by food producers. The organization's goal was to oppose the California citizen's initiative, known as Proposition 37, demanding mandatory labeling of foods containing genetically modified ingredients. Although the proposition was defeated, there was strong consumer backlash against the coalition's opposition. Consumer advocates encouraged nationwide boycotts of coalition members, and movements were started in several other states to enact similar labeling requirements. As a result, ConAgra and others in the Coalition met with Walmart (the largest food retailer in the U.S.) to seek a nationwide labeling system for genetically modified foods, instead of trying to defeat the measures in every state. 2007: Jar of Peter Pan peanut butter with "2111" product code, recalled for potential Salmonella contamination. Conagra recalled 19 million pounds of ground beef in July 2002 with E. coli bacterial contamination. It was the third-largest recall up to that time. That meat was linked to the illnesses of 19 people in six Western and Midwestern states. In February 2007, Conagra recalled jars of Peter Pan and Great Value brand peanut butter with the product code "2111" on the lid, because they were linked to a Salmonella outbreak. Ultimately, the Centers for Disease Control (CDC) documented more than 628 individuals who were stricken with Salmonella poisoning in 47 states that could be traced back to Peter Pan and Great Value peanut butter. Of those, 20% were hospitalized, according to the CDC, which reported no deaths associated with the outbreak. 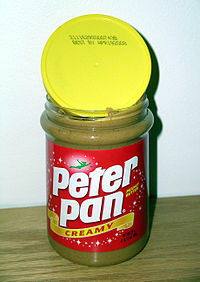 Since Peter Pan (but not Great Value) is only made at one plant, the recall included all Peter Pan jars sold in the U.S. between May 2006 and February 2007. In May 2015, the company agreed to plead guilty to knowingly releasing products tainted with Salmonella into interstate commerce. Sentencing was delayed by U.S. District Court Judge W. Louis Sands, who ordered nationwide newspaper advertisements searching for victims of the outbreak so the government could supply Victim Impact Statements for inclusion in the pre-sentence report. On September 4, 2007, the Flavor and Extract Manufacturers Association recommended reduction of diacetyl in butter-like flavorings, such as those used in popcorn, due to cases of the potentially fatal disease bronchiolitis obliterans or "Popcorn Workers's Lung" appearing among plant workers exposed to diacetyl fumes, as well as in one case that involved a popcorn consumer. The next day ConAgra Foods announced that it would soon remove diacetyl from its Jiffy Pop and Orville Redenbacher's popcorn products. On October 11, 2007, Conagra asked stores to pull the Banquet and generic brand chicken and turkey pot pies due to 152 cases of Salmonella poisoning in 31 states being linked to the consumption of Conagra pot pies, with 20 people hospitalized. At that time, both the USDA and Conagra decided in favor of a consumer advisory and against a recall. ConAgra said the issue stemmed from pies not being cooked thoroughly in older microwaves, and that the package's heating instructions would be changed to reflect different microwaves. However, the plant in Marshall, Missouri, where the pot pies were manufactured closed on October 11 as well. By October 12, a full recall was announced, affecting all varieties of frozen pot pies sold under the brands Banquet, Albertson's, Food Lion, Great Value, Hill Country Fare, Kirkwood, Kroger, Meijer, and Western Family. The recalled pot pies included all varieties in 7-oz. single-serving packages bearing the number P-9 or "Est. 1059" printed on the side of the package. By October 14, 174 cases of Salmonella poisoning in 32 states were linked to consumption of the contaminated ConAgra pot pies, with 33 people hospitalized. Public interest groups criticized Conagra for the delay in issuing the recall, a decision which Conagra defended by saying the recall was a precaution. At the time of the recall, the USDA had still not identified the source of the Salmonella contamination. On October 17, the Colorado Department of Public Health reported that "An investigation by the Centers for Disease Control and Prevention and state public health departments involved a large cluster of illnesses caused by Salmonella that identified these products" and stated that, "Nationally, at least 211 individuals from 35 states have become ill." From January 1 through December 31, 2007, the CDC identified a total of 401 cases in 41 states. On June 9, 2009 at 11:27 am ET, an explosion rocked the Slim Jim manufacturing plant in Garner, North Carolina resulting in the collapse of a section of the facility's roof and wall. Four workers were killed while 67 others – including three firefighters – were hospitalized for burns and exposure to ammonia gases. The explosion happened when natural gas was purged into the interior of the building during commissioning of a new, gas-fired water heater. This explosion was directly responsible for an amendment to the National Fuel Gas Code prohibiting fuel gas piping systems in large buildings from being purged indoors. On March 3, 2010, ConAgra announced that the Garner plant would close in approximately 18 months, and Slim Jim production would be moved to a plant located in Troy, Ohio. ^ a b c d e f "Conagra Brands, Inc. 2017 Annual Report (Form 10-K)". sec.gov. U.S. Securities and Exchange Commission. June 2017. ^ "Conagra Brands". Fortune. Retrieved December 1, 2018. ^ "ConAgra to restate earnings after unit probe". MarketWatch. June 21, 2001. ^ "ConAgra Foods Completes Sale Of Fresh Beef And Pork Business | Conagra Brands". Retrieved July 22, 2018. ^ "ConAgra Will Restate Some Results". The New York Times. Reuters. April 13, 2005. ^ "ConAgra Foods to Sell Refrigerated Meats Businesses to Smithfield Foods for $575 Million; Sale Includes Butterball, Eckrich and Armour Brands". July 31, 2006. Retrieved July 22, 2018. ^ "Less meat in ConAgra diet". tribunedigital-chicagotribune. Retrieved July 22, 2018. ^ "ConAgra Foods to make big purchase". KTVO News. Associated Press. November 27, 2012. Retrieved November 28, 2012. ^ "ConAgra to Cut 1,500 Jobs, Move Headquarters to Chicago". The Wall Street Journal. October 1, 2015. Retrieved October 1, 2015. ^ "ConAgra Foods Acquires Chinese Potato Processor TaiMei Potato Industry Limited". Marketwatch. July 14, 2014. Retrieved July 14, 2014. ^ Steele, Anne. "ConAgra Names CEO, Chairman of Potato Business Spinoff". WSJ.com. Wall Street Journal. Retrieved July 13, 2016. ^ "Conagra Brands completes Lamb Weston spinoff, name change". AP News. ^ Hirsch, Lauren (September 22, 2017). "Orville Redenbacher's popcorn owner Conagra is acquiring Angie's Boomchickapop". CNBC. ^ Inc., Conagra Brands,. "Conagra Brands Completes Acquisition Of Angie's Artisan Treats, LLC, Maker Of Angie's® BOOMCHICKAPOP® Ready-To-Eat Popcorn, From TPG Growth". www.prnewswire.com. Retrieved May 10, 2018. ^ "Board of Directors". ConAgra Foods. Retrieved October 1, 2015. ^ "Carly Rae Jepsen And Cody Simpson Help Fight Child Hunger". Look to the Stars. PR Newswire. February 27, 2013. Retrieved March 6, 2015. ^ "Sherwin, NL, Conagra Lose $1.1 Billion Lead Paint Ruling". Bloomberg Businessweek. December 17, 2013. Retrieved October 1, 2015. ^ "ConAgra to Pay to Settle Disability Lawsuit". Los Angeles Times. Bloomberg News. May 21, 2003. Retrieved October 1, 2015. ^ Winter, Greg (July 20, 2002). "Beef Processor's Parent No Stranger to Troubles". The New York Times. ^ Draper, Bill (July 2, 2004). "KCK meatpacking plant shooting kills several". The Topeka Capital-Journal. Associated Press. Retrieved October 1, 2015. ^ "Conagra Set to Settle Criminal Charges It Increased Weight and Value of Grain". The New York Times. March 19, 1997. Retrieved April 30, 2010. ^ "The Top 100 Corporate Criminals of the 1990s". Multinational Monitor. 20 (7–8). July – August 1999. ^ "Historic District At Issue In Omaha". The New York Times. December 13, 1987. Retrieved February 2, 2014. ^ Callahan, Patricia (October 3, 2002). "Food industry campaigns against Oregon labeling proposal". The Wall Street Journal. CropChoice News. ^ "Responsible Shopper Profile: Conagra Foods". Green America. Retrieved October 1, 2015. ^ "Who's Funding Prop 37, Labeling for Genetically Engineered Foods?". KCET News. Retrieved December 29, 2017. ^ Strom, Stephanie (January 31, 2013). "Genetic Changes to Food May Get Uniform Labeling". The New York Times. Archived from the original on March 29, 2013. Retrieved March 29, 2013. ^ Becker, Elizabeth (October 7, 2002). "Parents of Sickened Children Ask for Tighter Rules on Food". The New York Times. Retrieved October 1, 2015. ^ Flynn, Dan (June 10, 2015). "Judge Wants a Thorough Search for Consumers Sickened by Peter Pan Peanut Butter". Food Safety News. Retrieved May 12, 2016. ^ Flynn, Dan (May 10, 2016). "ConAgra inches closer to sentencing for Peter Pan outbreak". Food Safety News. Retrieved May 12, 2016. ^ "ConAgra to drop popcorn chemical linked to lung ailment". USA Today. Associated Press. September 5, 2007. ^ Funk, Josh (October 11, 2007). "ConAgra asks stores to quit selling pies". USA Today. Retrieved October 1, 2015. ^ "ConAgra closes pot pie plant out of Salmonella concerns". Arkansas Democrat-Gazette. October 9, 2007. Retrieved October 1, 2015. ^ Weise, Elizabeth; Schmit, Julie (October 12, 2007). "ConAgra recalls all frozen pot pies". USA Today. Retrieved October 1, 2015. ^ "Critics say ConAgra Foods mishandled pot pie recall, incident shows food safety system's flaws". San Diego Union-Tribune. Associated Press. October 14, 2007. Retrieved October 1, 2015. ^ "Multistate Outbreak of Salmonella Infections Associated with Frozen Pot Pies --- United States, 2007". CDC. November 28, 2008. Retrieved October 1, 2015. ^ "ConAgra explosion to prompt safety recommendations". WRAL-TV news. January 14, 2010. Retrieved October 1, 2015. ^ "Statement of CSB Chairman Rafael Moure-Eraso Applauding the International Code Council for Emergency Amendment to Prohibit Indoor Purging" (Press release). Chemical Safety Board. October 27, 2010. Retrieved October 1, 2015. ^ "ConAgra to close Garner plant". WRAL-TV News. March 3, 2010. Retrieved October 1, 2015.